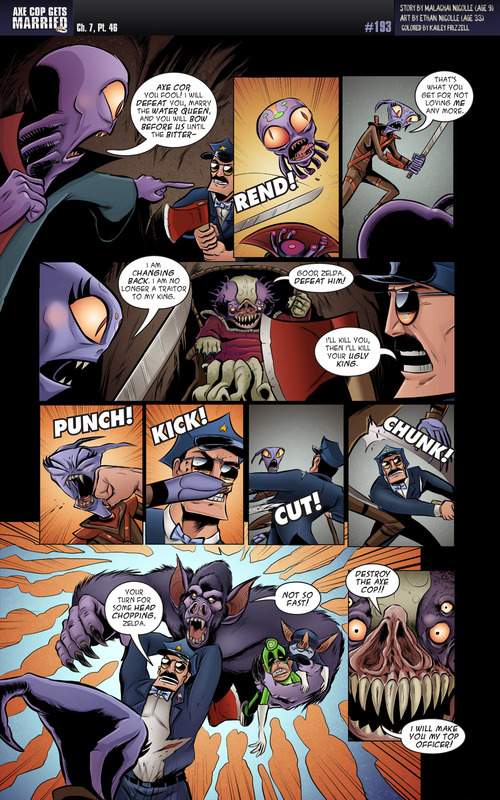 RT @AXECOP: Page 193 – Chunk: Chunk is a sound right? I think it is. You should definitely feel pride in panels 1 and 2. I for one was impressed at how you did that. 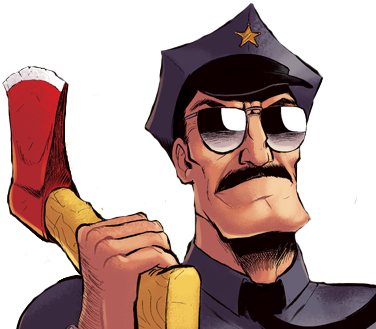 It’s good to see Axe Cop actually fight with his axe, again! The game, it is a-changin’. I like it. ’tis just a flesh wound. I don’t know if I should feel shame or pride for the combination of dialog and sound effects on panels one and two, but I simply couldn’t help myself. Pride. Definitely pride. A groan is as good as a laugh to a wicked punster. Hmm, quote formatting didn’t seem to show up there – first paragraph was quoted from Ethan’s author notes, above. The King was smart to immediately accept Zelda back into his service and not to hold a grudge. The King was maybe not so smart to offer to promote Evil Bunky over Zelda; she doesn’t seem to lightly handle being spurned. I don’t know why I’m bothering trying to predict the future in a comic as frenetic as this one, though.